Every little bit of activity counts — and the first steps toward fitness have the most impact. 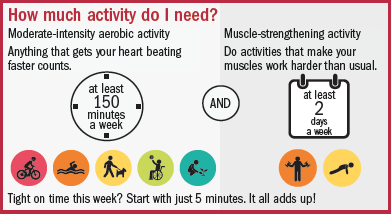 Without question, being physically active is the best thing you can do for your heart health. Here's the good news: according to new federal exercise guidelines, even just a few minutes of moving can count toward the recommended aerobic exercise goal of 150 minutes of moderate-intensity activity per week. "Studies show that the total amount of energy expended is what's important for health, not whether it comes in short or long bouts," says Dr. I-Min Lee, a professor of medicine at Harvard Medical School who studies the role of physical activity in disease prevention. "This certainly is an encouraging message for people who are inactive," she adds, noting that the previous guidelines recommended exercising in sessions lasting at least 10 minutes. The new guidelines, which were issued by the U.S. Department of Health and Human Services in November 2018, also emphasize the health risks of sitting, lying, or reclining for extended periods of time during normal waking hours. This sedentary behavior has been linked to greater risk of high blood pressure, heart disease, and death from any cause. If you tend to sit for long stretches, setting a timer on a fitness band or smart watch that goes off at regular intervals (say, every 30 minutes) may help remind you to get up and move around, says Dr. Lee. The more you can move, the better, but even just a little exercise can make a difference. In fact, the greatest health benefits seem to occur when people transition from being inactive to active, even if they still fall short of the recommended exercise goals. The steepest reductions in the risk of heart disease occur at the lowest, initial levels of activity. Blood pressure. Exercise may lower blood pressure for up to 13 hours after the activity. Done on a regular basis, it may lower systolic blood pressure (the first number in a reading) by an average of 5 to 8 points. Anxiety and depression. Exercise appears to ease anxiety symptoms right away, and over the long term, physical activity seems to reduce the risk of depression. These mental health conditions are increasingly being recognized both as a cause and a consequence of cardiovascular disease. Insulin sensitivity. Activity can improve your body's response to insulin, the hormone that helps control blood sugar levels. Better insulin sensitivity may lower the risk of type 2 diabetes, a major risk factor for cardiovascular problems. Sleep. Getting more physical activity may help you fall asleep more quickly, improve your sleep efficiency (meaning you spend a higher percentage of your time in bed actually sleeping), and help you sleep more deeply. Other possible benefits include less daytime sleepiness and a reduced need for sleeping pills. Of note: people with insomnia (trouble falling and staying asleep) as well those with obstructive sleep apnea (a nighttime breathing disorder marked by breathing pauses) have reported these benefits. Excess weight is yet another common problem linked to heart disease. And while the benefits take longer to accrue, exercise may help people stave off the weight gain that often occurs as people age. To lose weight, you'll also need to eat fewer calories. If you do lose weight, being active helps prevent those pounds from creeping back on. But if you don't lose weight, don't give up on exercise! According to the guidelines, the health benefits of physical activity are generally independent of body weight. You will still reap those benefits, no matter how your weight changes over time. You can meet your weekly physical activity goal by getting just 22 minutes of moderate-intensity aerobic activity every day. (Aerobic activities include those that get your heart pumping faster than normal.) Or you could exercise for an hour on Saturday and again on Sunday, and squeeze in another 30 minutes one day during the week. This activity planner (health.gov/MoveYourWay/Activity-Planner) can help you tally up your activities, including those that build muscles. Per the guidelines, these strengthening exercises should be done twice weekly in addition to your aerobic exercise. Note that you don't have do push-ups or go to a gym to lift weights. "In fact, you don't even need dumbbells; you can use everyday items in your house, such as a 5-pound bag of rice," says Dr. Lee. Or you can use stretchy resistance bands, which look like big, wide rubber bands, for a gentler strength workout. Using them is a simple way to do strength training, particularly for older people, she adds.